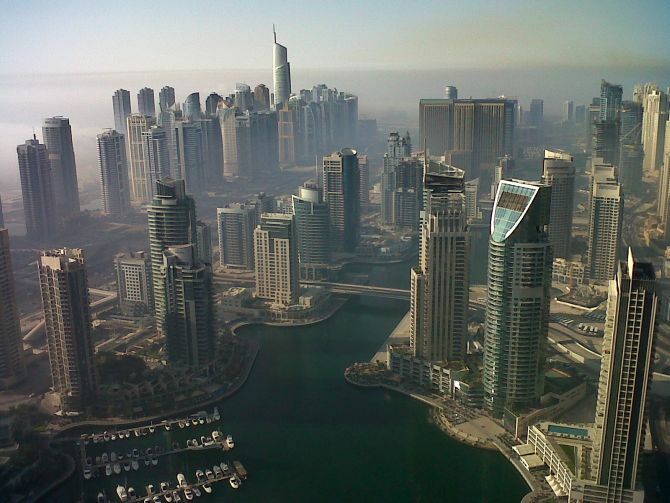 Middle East is undertaking some of the biggest planned cities and towns in the world. While some of these developments are very exotic, there are few which are setting example of how the future cities should be. 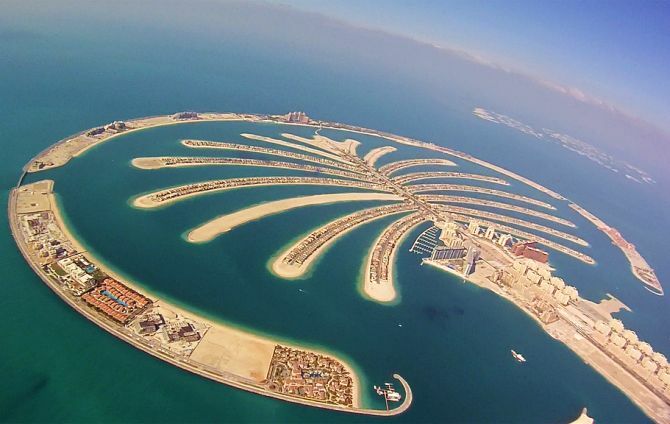 Take an example of Palm Jumeirah. It is probably the most exotic man-made islands, and they make a person wonder about human capabilities. MasdarCity, on the other hand, is a complete green city that will use renewable energy sources and plans to keep the development car-free. While these new cities are grabbing headlines, the city of Navi Mumbai has remained the biggest man made city in the world. In India, two more world class cities are coming up that boast of international standards. One of them is in Gujarat and the other one in Maharashtra. Let’s take a look at some of the biggest planned developments in the world. 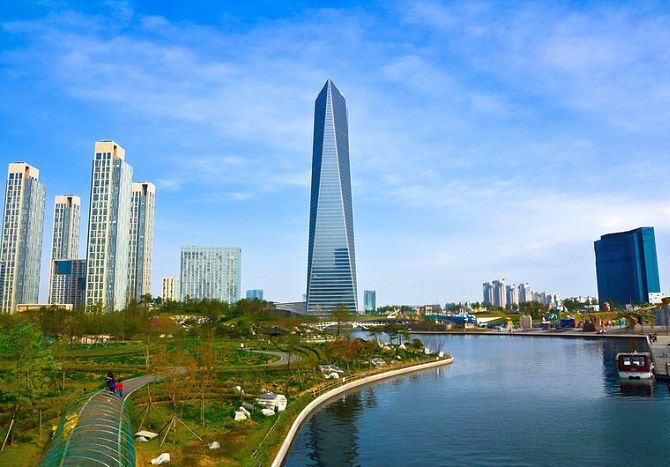 Image: Songdo International Business District, South Korea. The World or World Islands is an artificial archipelago of around 300 islands constructed in the rough shape of a world map. This project is one among several artificial island under construction in Dubai. In fact, your can see Palm Jumeirah on the left of the The World in the photo. The ruler of Dubai Sheikh Mohammed bin Rashid Al Maktoum conceived the project and Nakheel Properties is the developer for the project. The project is facing delays since the 2008 financial crisis. Khazar Islands is an artificial archipelago 25 km south of Baku in Azerbaijan consisting of 41 islands spread across 3,000 hectares over the Caspian Sea. The centrepiece of the project is Azerbaijan Tower, which will be the tallest in the world. The project will contain office, residences, hotels, schools, hospitals, shopping malls, cultural centres universities, Formula 1 racing track. The project is expected to finish by 2020-2025 and house 1 million population. 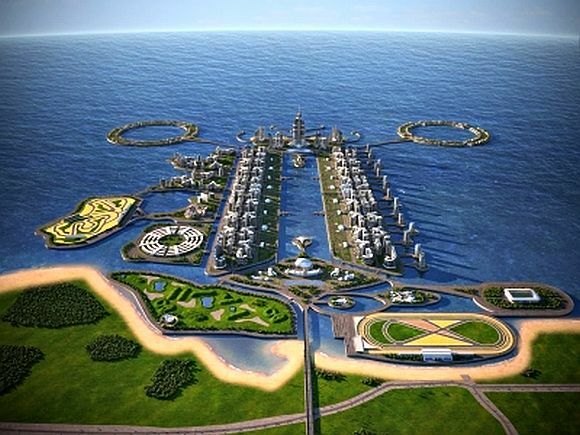 Image: This image is a rendering of the Khazar Islands, an artificial archipelago under construction in Azerbaijan. Dubai Meydan City is the new development under construction in Ras Al Khor area of Dubai. The entire development will cover more than 40 million square feet GFA on a land size of around 15 million square feet. 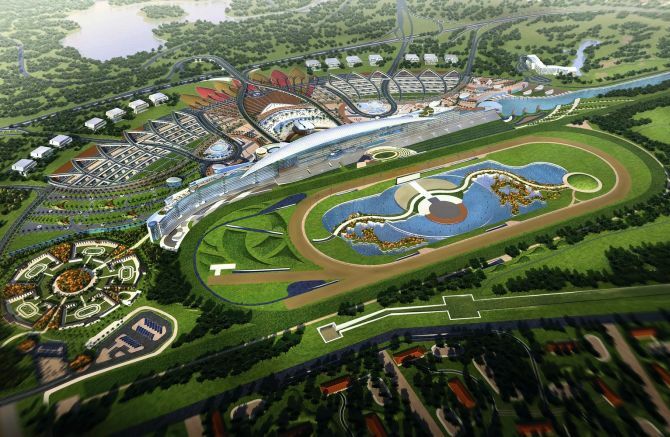 The main attraction of the development is Meydan Racecourse, which can accommodate 60,000 spectators. The development also includes a 9-hole golf course and world’s first 5-star trackside hotel. Some of the attractions in the Meyden City includes Meydan Marina, Horizons (residential development), Metropolis (office space), and retail spaces. Kingdom City is a 2 square mile project designed by Kingdom Holding Company, the firm owned by Prince Al-Waleed bin Talal. The project is mixed use and will have commercial and residential development including homes, hotels, and offices. 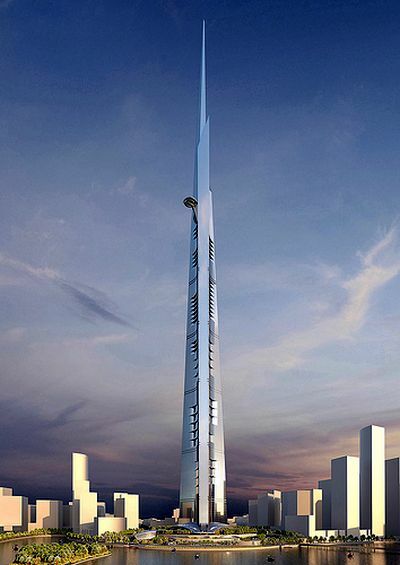 The centerpiece of the development project is Kingdom Tower - a building planned to become the tallest in the world. The Kingdom City is a three-phase project. 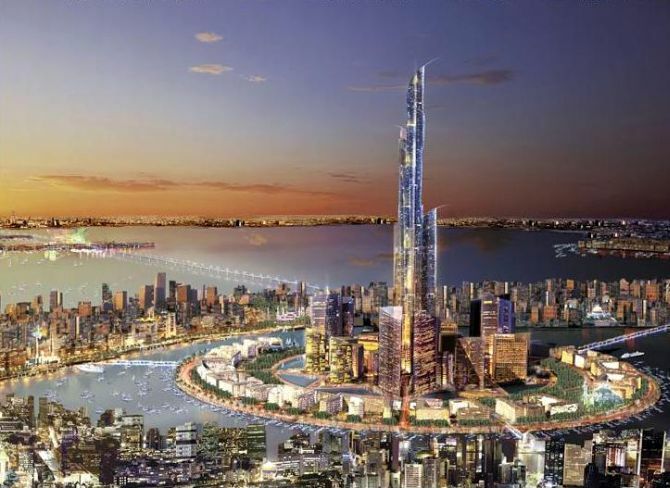 Kingdom Tower will be built in phase-one, infrastructure for the project will be created in phase-two, and phase-three has not been currently revealed, according to Wikipedia. Image: The latest rendering of the newly green lighted Kingdom Tower in Jeddah, Saudi Arabia. Masdar City is the latest of a small number of highly planned, specialised, research and technology-intensive municipalities that will rely entirely on solar energy and other renewable energy sources. It is located 17 kilometres south-east of the city of Abu Dhabi, close to the airport. The city is designed to be a hub for cleantech companies. The initial plan was to keep the city free of cars. The planners wanted only public mass transit and personal rapid transit systems. But these plans have been undergoing revision. The city as a whole was originally intended to be completed by 2016 but due to the impact of the global financial crisis, the date has now been pushed back to between 2020 and 2025, according to Wikipedia. Business Bay is a central business district under construction in Dubai, United Arab Emirates. The project features numerous skyscrapers and will have upwards of 240 buildings, including commercial and residential. This area, when completed, will be a new 'city' within the city, which covered an area of 5.9 million square metres. Some of the buildings in Business Bay area includes JW Marriott Marquis Dubai Tower (tallest hotel in the world), Vision Tower, Churchill Residency, and Dubai Tower. The project is expected to complete by 2015. 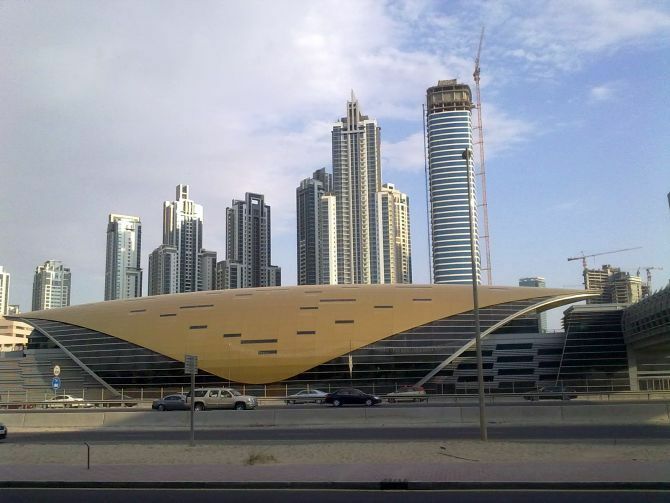 Image: Dubai metro station Type 1 at Business Bay. 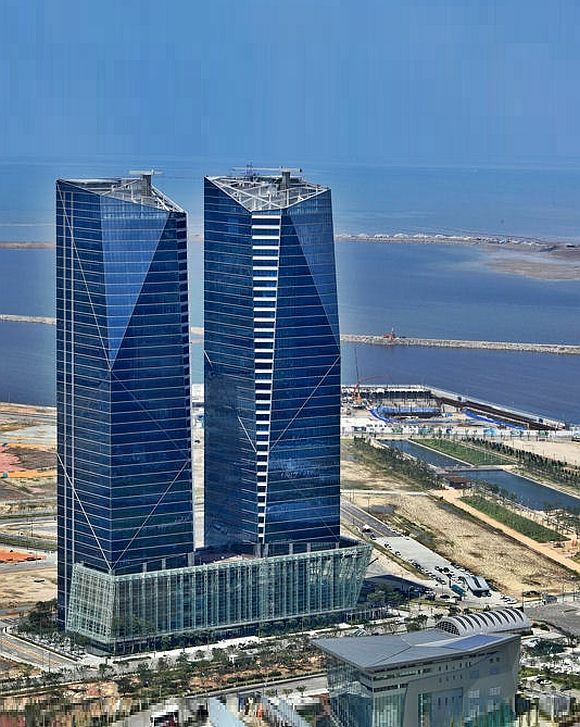 Songdo International Business District (SIBD) is a new city built from scratch on an area of 1,500 acres. The land is reclaimed along Incheon's waterfront. Other than world-class offices (50 million square feet), SIBD will also feature school, hospitals, housing (80,000 apartments), and cultural amenities. The project is expected to complete in 2015. 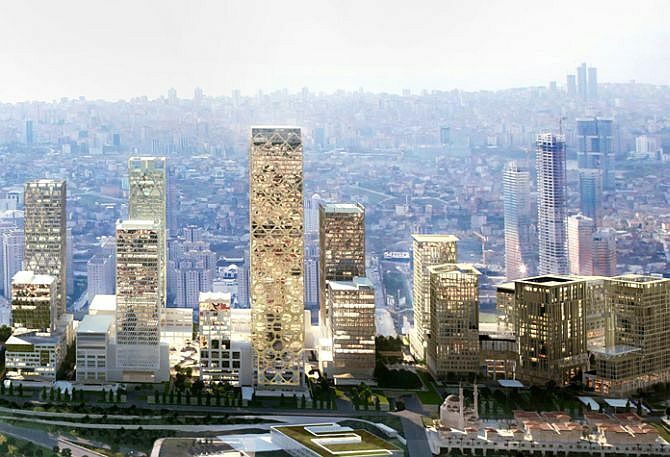 Located in Istanbul’s modern suburban district of Atasehir, Istanbul Finance Center aims to become one of the world’s top 20 financial centres that will cater to banks, multi-national corporations and services firms. The project spans to 70 hectares (about 173 acres). The total development area is around 1 million square metres and consists of office spaces, retail, residential buildings, hotels and conference centres. 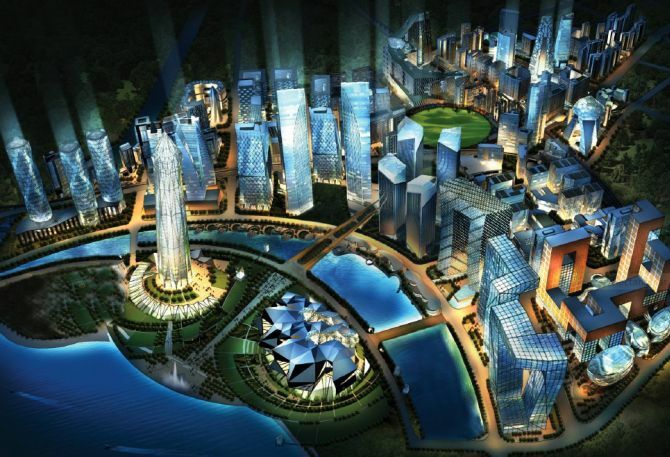 Turkey government has undertaken multi-billion dollar urban transformation project. The government is demolishing old buildings and constructing millions of fresh ones that are unsafe in the country’s earthquake-prone provinces. Companies world over are watching the development as it poses an opportunity of $400 - $500 billion. 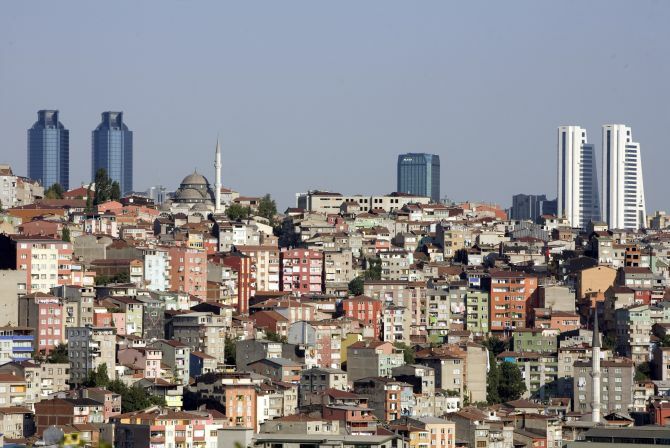 Image: Skyscrapers in the city's business district shape the skyline over Gultepe district in Istanbul. 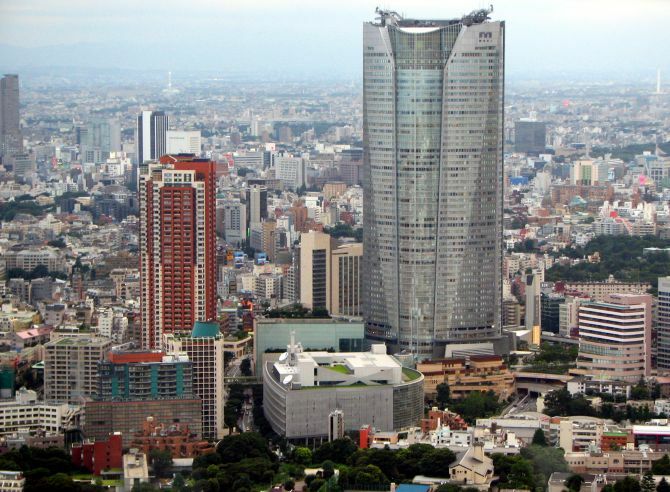 Roppongi Hills is an integrated development constructed by Minoru Mori. It consists of office space, residences, restaurants, cafes, movie theatres, a museum, a hotel, retail, and parks. The centrepiece of this project is Mori Tower, which is a 54-storey building that houses an art museum, clinics, stores, the offices. Image: Roppongi Hills during the Day. View from Tokyo Tower. CityCentre is the largest privately financed development in the United States built on a 76 acres land located on the Las Vegas Strip. MGM Resorts International and Dubai World are the owners of the project. The project has around 2,400 condominium and condo-hotel and approximately 4,800 hotel rooms, distributed within several high-rise towers around The Crystals, an ultra high-end retail mall, according to Wikipedia. It further states that the project is designed to have all commodities for daily life, featuring a 4,000-room hotel and casino (Aria), two 400-room boutique hotels (The Residences at Mandarin Oriental, with 227 residential condo units, and the Harmon Hotel and Spa), a purely residential offering (Veer Towers), a condo-hotel (Vdara Condo-hotel) and a 500,000 sq ft (46,000 m2) retail and entertainment district which was intended to house the first grocery store directly on the Strip (though as of July 2011, there is no grocery on the property). 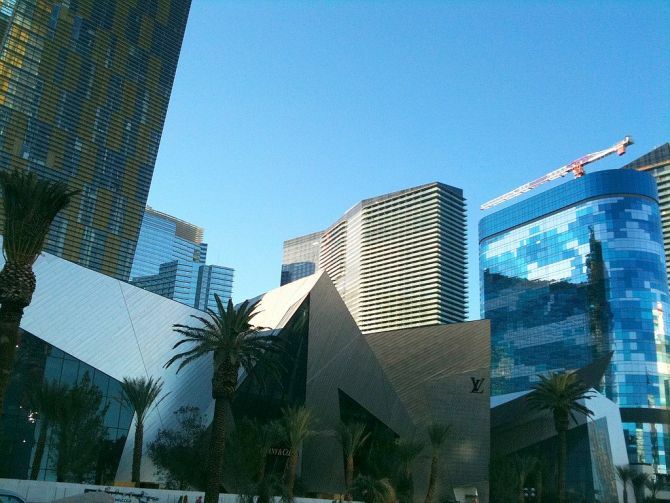 Image: Crystal District at CityCenter in Las Vegas. La Defense is the Central Business District of the Paris Metropolitan area. La Defense provides France with a modern set of skyscrapers while Paris itself retains most of its original architecture and character. In fact, La Defense is Europe's largest purpose-built business district with 560 hectares area, 72 glass and steel buildings and skyscrapers, 180,000 daily workers, and 3.5 million square metres of office space, according to Wikipedia. 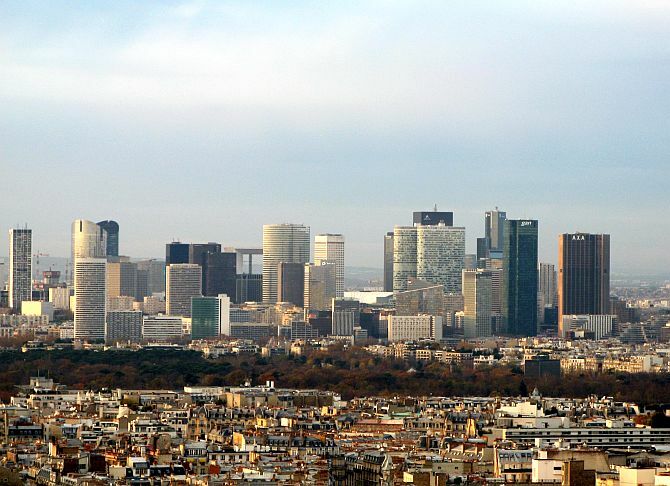 It has many of Paris’ tallest buildings and most of corporate head office based in the country. The CBD is visited by 8 million tourists every year and has an open-air museum. Image: Skyscrapers of La Défense seen from the Eiffel Tower. This city, located close to the capital Kuala Lumpur, serves as the federal administrative centre of Malaysia. The need to shift the government offices was felt as Kuala Lumpur getting overcrowded and congested. Putrajaya was the brainchild of former Prime Minister Tun Dr Mahathir Mohammad and it's named after the first Prime Minister Tunku Abdul Rahman Putra. Putrajaya was planned as a garden and intelligent city. As a result, it has lot of open and green areas. Work on the city started in 1995 and the entire government staff was shifted here in 2005. 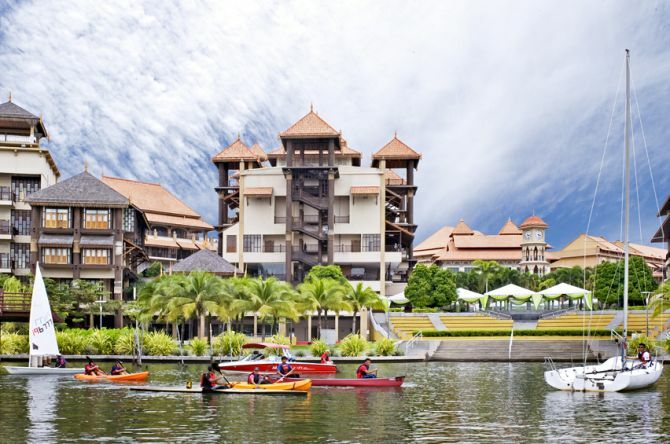 Image: Water activities in Pullman Putrajaya Lakeside. The capital of Brazil is actually a planned city that was founded in 1960. 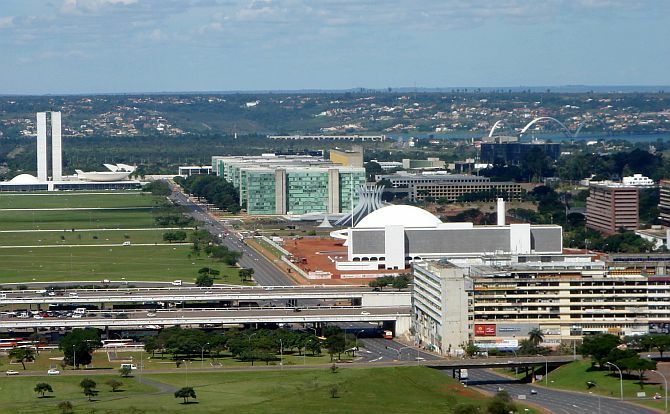 It was due to efforts of Lucio Costa and Oscar Niemeyer that Brasilia came into existence. The duo planned and developed the city as they felt that the capital of Brazil needs to move from Rio de Janeiro to a more central position. Juscelino Kubitschek, President of Brazil from 1956 to 1961 wanted to build a separate city, which was part of his election campaign. Lucio Costa won a contest to design the city and Oscar Niemeyer, a close friend of Costa, joined him. The city's design divides it into numbered blocks as well as sectors for specified activities, such as the Hotel Sector, the Banking Sector and the Embassy Sector. Brasília was chosen as a UNESCO World Heritage Site due to its modernist architecture, according to Wikipedia. King Abdullah Economic City (KAEC) was founded by King Abdullah in 2006. It's a unique partnership between the Kingdom of Saudi Arabia (KSA), its people and investors, creating a new world city that will benefit businesses, citizens and the entire Kingdom of Saudi Arabia. The total area under development is 173 sq km and the city is located along the coast of the Red Sea, around 100 km north of Jeddah. The whole city is expected to complete by 2020. The city will help diversify the oil-based economy of the kingdom by bringing direct foreign and domestic investments. 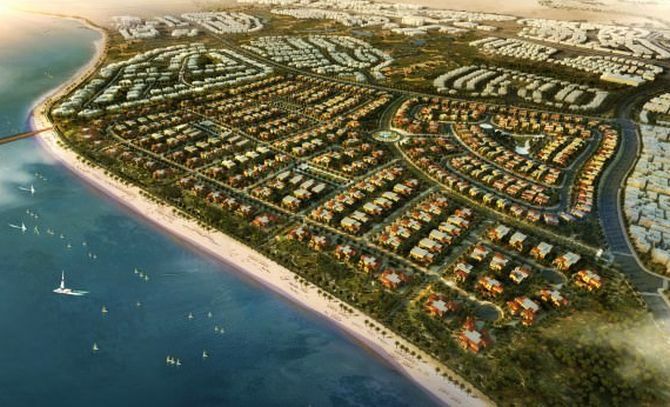 Madinat al-Hareer is proposed 250 square km planned urban area in Subiya, Kuwait. Madinat al-Hareer means ‘City of Silk’. Madinat al-Hareer will have numerous tourist attractions, hotels, spas, public gardens, business center, conference areas, environmental areas, athletic areas, and areas that concentrate on media, health, education, and industry. The city will be built in individual phases with total completion within twenty-five years. After the city was rocked by the earthquakes, the government decided to rebuilt the city and demolish several residential areas now deemed unsuitable for living. The city will also see infrastructure upgrades and addition of commuter rail. 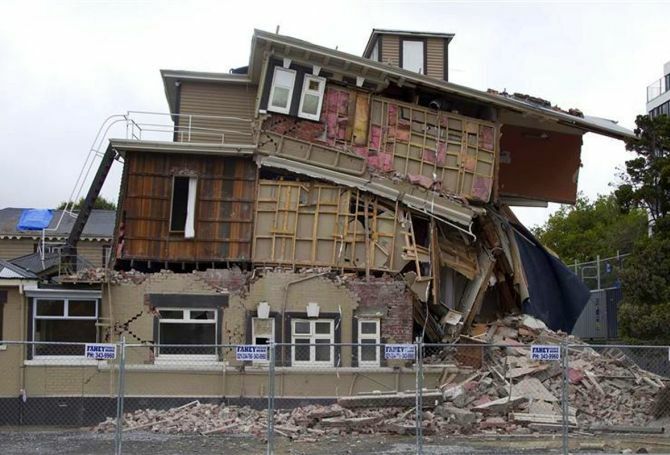 Image: A damaged backpackers hostel is seen after an earthquake in central Christchurch. Hamburg is developing a new city area along the Elbe River. On an area of 157 hectares, a lively city with a maritime air is taking shape, bringing together a variety of workplace and residential uses, culture and leisure, tourism and retail facilities. Earlier, the area had old port warehouses. 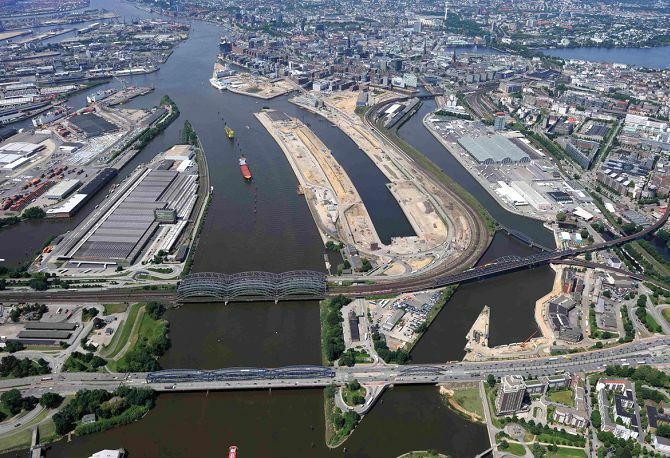 The project is the largest rebuilding project in Europe in scope of landmass (approximately 2.2 square km). HafenCity consists almost wholly of new buildings, since not many old ones can be retained or are worth preserving. When completely developed, it will be home to about 12,000 people and the workplace of 40,000 people mostly in office complexes, according to Wikipedia. It is the worlds largest man-made island. 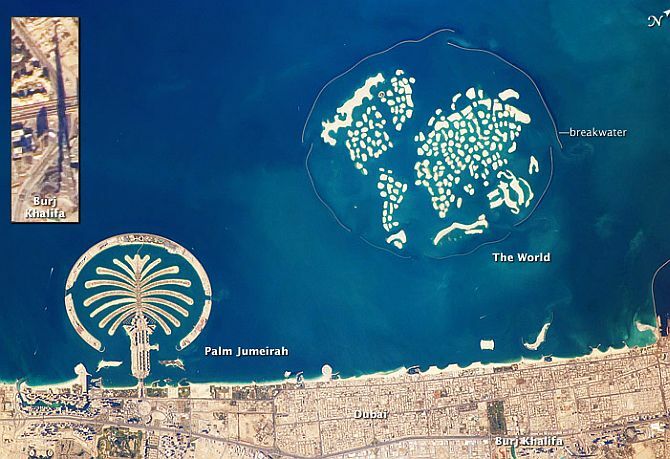 The Palm Jumeirah is man-made cluster of islands (artificial archipelago). They are created by reclaiming land. The project is carried out by Dubai government’s company Nakheel. It is one of three planned islands called the Palm Islands (Palm Jumeirah, Palm Jebel Ali and Palm Deira) which would have extended into the Persian Gulf, increasing Dubai's shoreline by a total of 520 kilometres. Brickell Key is a man-made island off the mainland Brickell neighborhood of Miami, Florida. 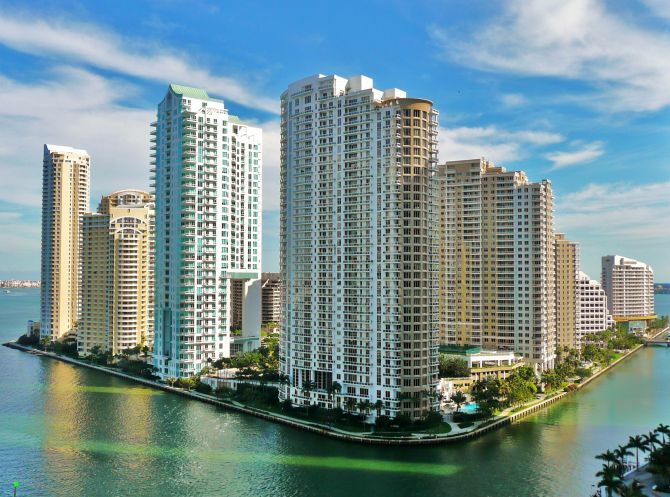 According to Wikipedia, the history of Brickell Key real estate can be traced to 1896, when Henry Flagler had a 9-foot deep channel dug from the mouth of the Miami River. In the process, Mr. Flagler created an off-shore property composed of two small islands. In 1943, a real estate investor, Edward N. Claughton, Sr. acquired the Brickell Key islands and eventually purchased additional bay bottom land to combine them to a 44-acre triangle-shaped tract separated from Brickell and Brickell Avenue by only a few hundred feet of water. Dubai Marina is a man-made canal city built on a 3-km stretch. When the entire development is complete, it will accommodate more than 120,000 people in residential towers and villas. Some of the developments on this include Jumeirah Beach Residence, which is the largest single phase residential development in the world and contains 40 towers. There’s another stretch called The Walk, which has residential properties, restaurants, clothing stores, boutiques, department stores, cafes and gym. Then there are other residential properties such as Al Sahab, Al Majara, and Park Island. 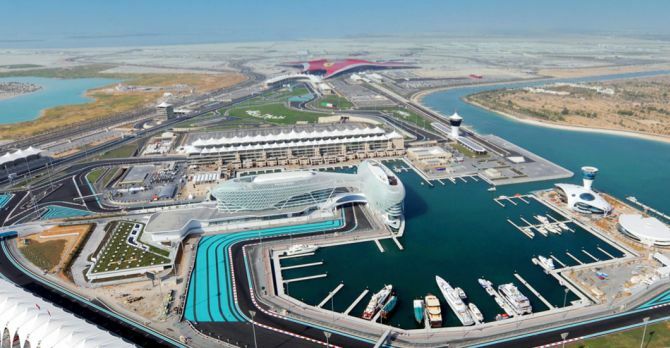 Yas Island is an artificially created island that can be reached by car, seaplane or boat. 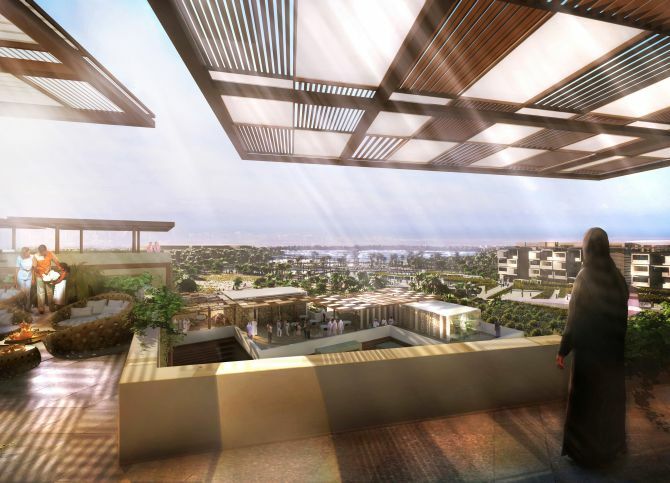 Yas Island occupies a total land area of 2,500 ha of which 1,700 ha will be claimed for development. The island holds the Yas Marina Circuit, which hosts the Formula One United Arab Emirates Grand Prix since 2009. The island’s development project was initiated in 2006 by Abu Dhabi-based Aldar Properties (master developer), with the aim of turning the island into a multi-purpose leisure, shopping and entertainment center at an estimated total cost of over $40 billion. 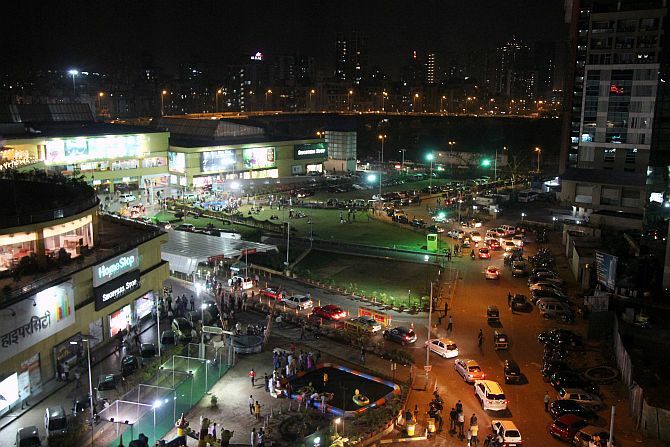 Navi Mumbai is the largest planned city in the world. It’s development was started in 1972 to de-congest Mumbai. Since than, the city has been expanding. To design the city, best of architects were involved. Some of the names include Charles Correa, Shirish Patel and Pravina Mehta. To make a single agency responsible for the development, the government formed The City and Industrial Development Corporation (CIDCO). Over time, CIDCO handed the civic work to the Navi Mumbai Municipal Corporation (NMMC). A new international airport, too, has received government’s green light. As Mumbai airport cannot be expanded due to limited availability of land, a massive international airport is planned at Navi Mumbai. 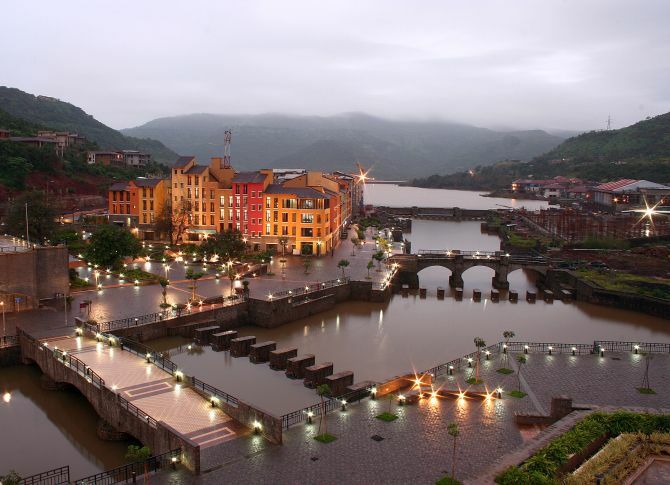 Lavasa is a private planned hill city. The city is one fifth of the size of Municipal Corporation of Greater Mumbai and is a three-hour drive from Mumbai and an hour’s drive from Pune. It is stylistically based on the Italian town Portofino. It is based on the principles of New Urbanism which organizes all components of essential city life within walking distance from each other. Lavasa is planned for an estimated permanent population of around 300,000 residents and a tourist inflow that is envisaged at 20 lakh per annum. The promoters of the project include Hindustan Construction Company (HCC), Avantha Group, Venkateshwara Hatcheries, and Vithal Maniar. Gujarat International Finance Tec-City or GIFT is a planned business district in Gujarat that spans over 986 acres of land. Its main purpose of this project is to provide high quality physical infrastructure (electricity, water, gas, district cooling, roads, telecoms and broadband), so that finance and tech firms can relocate their operations from other major cities. It will have a special economic zone (SEZ), international education zone, integrated townships, an entertainment zone, hotels, a convention center, an international techno park, Software Technology Parks of India (STPI) units, shopping malls, stock exchanges and service units, according to Wikipedia. Gujarat Urban Development Company Limited (GUDCOL) and Infrastructure Leasing & Financial Services (IL&FS) are developing the project jointly.